Thank you for visiting Dilmaghani.com, the local, national and world-wide online resource for all area hand knotted and flat woven rugs including program line and one-of-a-kind Oriental Rugs, Antique Rugs, Oversize Oriental Rugs, Custom Rugs and carpets. Dilmaghani, a premier manufacturer, importer and wholesale distributor of fine Oriental Rugs and area rugs, serves the wholesale and retail markets from its Scarsdale NY headquarters and Brewster NY wholesale/outlet. The Dilmaghani Company features the largest and most eclectic selection and range of sizes in the carpet trade. We specialize in Antique and Semi-Antique large, oversize, mansion size, palace size, unusual size Oriental Rugs. We invite you to browse our comprehensive Oriental Rug inventory online at: LargeRugsCarpets.com and Dilmaghani’s Rug Search Gallery and Database, our rug “library” of carpets. We continually add inventory photographs to our websites. They comprise only a representation of our vast inventory of many thousands of rugs. For your particular rug requests, we provide a form for you to complete and submit to us so we may make a more detailed and complete inventory search for you. 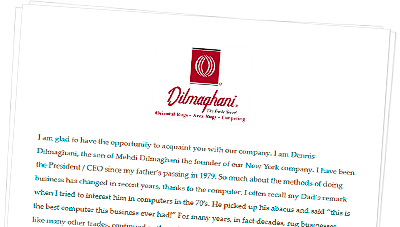 My father, Mehdi Dilmaghani (1900-1979), traveled from his native Persia to the US with a dream and, in 1922, established our company in New York City (Manhattan). Continuing his Persian family’s long tradition of fine Oriental rug production, for decades he was among few rug importers in the US and the Dilmaghani company quickly became known nationwide for quality area rugs. Our family’s Persian looms, in villages throughout my father’s homeland, produced some of the most beautiful 20th century Kerman (Kirman), Tabriz and Sarouk Persian rugs all under my father’s supervision. Cyrus Crown®, our company’s trademark, was woven into the border of many finer pieces and still signifies excellence for Oriental rug appreciators. With the finest dyes, wool and expert craftsmanship, Dilmaghani Oriental Rugs age gracefully – evidenced by our signature Antique Rugs made well over 100 years ago. Many of these antiques are still in use into the 21st century and demonstrate the enduring quality of our rugs. Our company withstood many “tests of time” thru the 20th century and the recent 21st century economic turmoil. Our business remains strong and our family committed to providing the best in fine Oriental carpets at the fairest prices available. In recent years, political, economic and cultural shifts in the rug producing country have made it nearly impossible to continue production of our Cyrus Crown brand. We still maintain a fine stock of many beautiful Cyrus Crown pieces that have never been used. They were made with the same traditional methods and standards as our legendary antiques. Dilmaghani and its divisions provide a broad range of products and services related to Oriental and hand-knotted area rugs. We invite you to visit our showroom on Central Avenue in Scarsdale New York (Westchester County), our Brewster NY (Putnam County) Rug Warehouse & Carpet Outlet as well as our select nationwide retailers (ask for our brand), or browse our international-friendly websites! Our New York Rug Showroom in Westchester County, (Scarsdale), offers retail customers, designers and architects the best selection of Oriental Rugs, area rugs, custom rugs and new rugs, hand-knotted, hand-tufted, oversized rugs and Antique Rugs. Our Westchester store is a favorite among New York Interior Designers. FlyingCarpets Rug & Carpet Warehouse Outlet in Brewster, NY specializes in closeouts of area rugs and Oriental rug bargains at warehouse outlet prices! Our Rug Warehouse is just an hour and 15 minute drive North of New York City. An amazing source for carpets as featured in TV’s ABC Extreme Makeover Home Edition. Dilmaghani’s wholesale division (trade only) supplies Oriental Rug and furniture stores with fine Dilmaghani area rugs nationwide. Our Rug Cleaning department services customers throughout the New York Metropolitan and Tri-State area, providing professional Oriental rug cleaning with free pickup and delivery. In home carpet cleaning and upholstery cleaning is also available. Search AREA RUGS & CARPETS ONLINE! Dilmaghani’s rug photo gallery catalogs our massive inventory including new hand knotted carpets, area rugs, semi-antique, and antique Oriental Rugs for easy viewing. For emergency stain removal and spot removal advice from the Oriental Rug experts, Dilmaghani’s online searchable Stain Removal Guide is available 24/7 to help remedy any type of spot or stain! 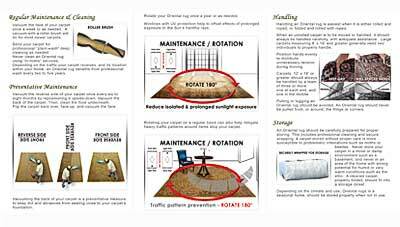 It’s Earth friendly and “Green” Stain removal guide. We want Dilmaghani’s to be the place where you find your next area rug, Oriental Rug or Custom Rug! Whether you’re a decorator, appreciator, collector, connoisseur, or searching for a special interest rug, please call, visit or email us. Mehdi Dilmaghani & Co. Inc.